Alice Starmore on the reissue of Tudor Roses. A little elbow grease, a little moisture and voilà: no more weaving in ends. DEBORAH NEWTON: ACCIDENT OR DESIGN? How to knit a well-shaped lapel. How a phone call from the Ralph Lauren design team gave an Oregon ranch a front-row seat at the Winter Olympics in Sochi, Russia. By Daryl Brower. Quick to knit, vests keep you in style indoors and out. New takes on the iconic motorcycle jacket. Mesh accents show off hand-painted yarns to best effect. Tara Stiles, founder of Strala Yoga and a passionate knitter, models coverups and accessories that go from studio to street in style. Cropped creations fit for a snow queen. Louisa Harding’s capelets enchant in cozy faux fur. Bas-relief effects lend drama to home décor. This title can be downloaded to your Apple iPad, Amazon Kindle and Android Tablets. 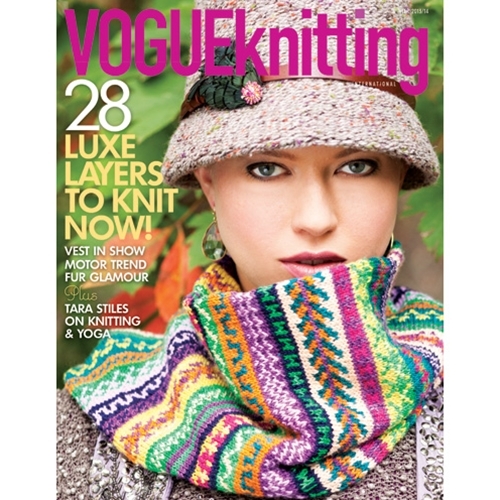 If you already have downloaded the Vogue Knitting Magazine App, you may purchase this item within the App. If you haven't downloaded the free app, click here to download.